Some Tips for Beginner Fly Fishing. There is a misconception out there about angling being a rich man's sport. I am by no means a rich man, yet I consider myself an angler. I'm not a professional angler, nor even an amateur. To me it isn't necessarily a sport but rather an incredibly enjoyable hobby. Not long ago I got started into fly fishing and to get going it cost me probably less than $100. I didn't buy waders because I could go with some sneakers and shorts. I didn't buy a fishing vest right away but just carried what I needed in my day pack. To be honest I could write about it all day but someone else already created 5 fly fishing tips that I think are pretty solid. The only other thing I might add is that don't let limited financial resources stand in your way. Just get out there and keep casting, there is no better way to learn. The link also has lots of good links to videos and such so check them out to. 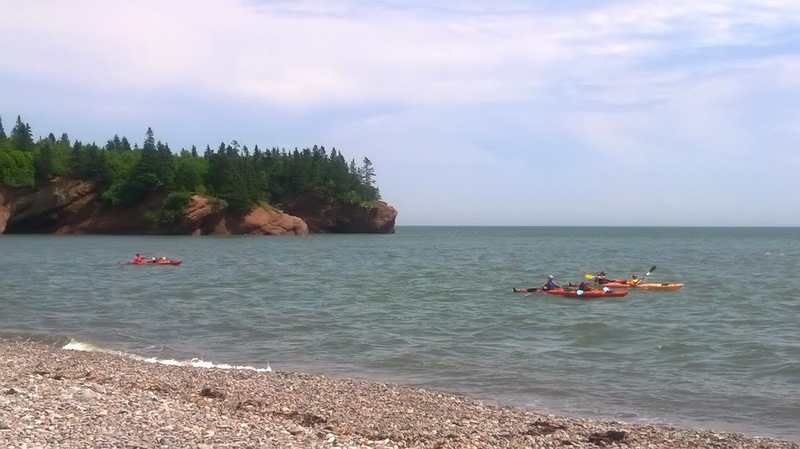 So there is another incident where some hikers need rescued off the Fundy Coast near the Fundy Footpath. For some coverage on the issue you can check out the CBC NB. I'm glad the hikers were rescued and that no one was seriously injured. It would be nice to know if these folks were actually hikers or simply day trippers who were out to enjoy Martin Head? I find it hard to believe that anyone hiking the Fundy Footpath would need to resort to climbing a rock face at 9:00pm to escape the tides. As someone who has hiked the trail for over 20years and completed many through trips in the area, it concerns me that we have people possibly hiking the trail unprepared. I'm not sure how to work around it. 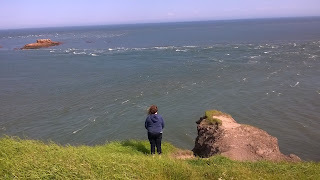 I know that one appeal of hiking is to test your own skills and abilities and to push your limits but maybe people have to be made more aware of the challenges of the Fundy Footpath. There are guidebooks, maps, websites, blogs (including this one), that provide a wealth of information on the trail so if someone gets into trouble it shouldn't be because of tides, it should be because of an injury or health concerns. People need to better prepare themselves. Sorry this is jumpy but I wanted to get it out there. I recently wrote a column in the Kings County Record about being in a Catch 22. I'll try to post it later as it relates somewhat to the issues that are developing on the Fundy Footpath. This blog was published in the Kings County Record on August 17, 2015. My goal in this entry was to get parents to think about allowing their children to push their boundaries a little and by doing so pushing themselves too. While I talk about the lessons the children learn, there are also lessons to learn for parents when their child gets hurt. You may realize things about your child you didn't realize. Maybe it will confirm for you how much your son still needs you, or maybe the opposite. If it is the opposite, maybe you can take pride in how much he has grown. 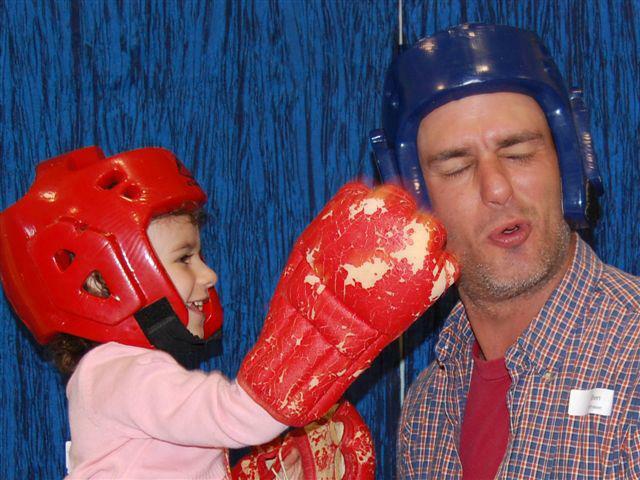 By letting your daughter push her limits, maybe you'll see how athletic she is and maybe you'll realize you might have a major league pitcher on your hands. Regardless, I hope you can take something from this. It finally happened. My daughter had a wipeout on her bicycle. I didn't witness it as I was at work, but apparently the whole block likely heard it. Her hands and legs are pretty bruised and battered now but she'll be the tougher for it. Following her bang up I started thinking about all those injuries and falls I've had in my life. I wondered if kids today maybe don't fall enough. I learned a great deal from the many falls and injuries I have experienced and I hope my kids learn from theirs as well. One of the worst bike accidents I can remember happened when I was trying a jump on my BMX. I over flew the landing area and ended up in a ditch up against an alder stump. I cut my knee for, I think, 8 stitches. What did I learn from this experience? Well for one, a cut on your knee is not likely going to kill you, even though I screamed like it might. I also learned that nothing beats great neighbors when you're in a jam. Thanks Georgette for taking me home and helping me to the hospital. Playing sports I was usually quick. I was a fast skater, I was a modest sprinter and a better long distance runner, and when I hike, I usually lead the group. Being fast is not always better though. Pushing my speed one night led me to severely breaking my wrist, but I lived and learned some limits. Finishing a hike along the coast one afternoon, I decided I wanted to be the first to take a swim in the Bay and on my run to the water, I cut my foot open on a shell. Those incidents have both illustrated to me that quick is not always better. As a youth I was a bit of a daredevil and I'm sure every time I left on my bike or my skateboard my mother wanted to stop me but instead let me enjoy being a kid. On one occasion my buddies and I stood at the top of Millbrook Road and decided it would be cool to skateboard down the hill. Everyone hesitated to actually push off, except me. I got part way down the hill and my wheels caught on a stone and head over heels I went. I had to go the hospital again, this time to have the stones removed from the palms of my hand, but I lived. The lesson learned was I don't need to prove myself to anybody. Unfortunately, I frequently need reminded of this lesson. As a parent today, I struggle to let my kids learn those tough, often painful lessons. If I don't let some of those accidents happen though they will struggle to know how hard they can push themselves or realize maybe that they might be pushing themselves too far. With every injury and mishap I experienced I found new boundaries and limits. When I was able to quickly recover from a mishap I would realize that I could push myself a little harder and when the mishap was more drastic I would readily see that I was at my upper limit. Learning these lessons on my own would eventually serve me as I became an independent adult and still serve me today. Maybe the only way it didn't help me was I still have no idea how much freedom to give my kids, any suggestions? Everyone has that go to spot. That place where you go when you need to get away from the hustle and bustle of the urban center. 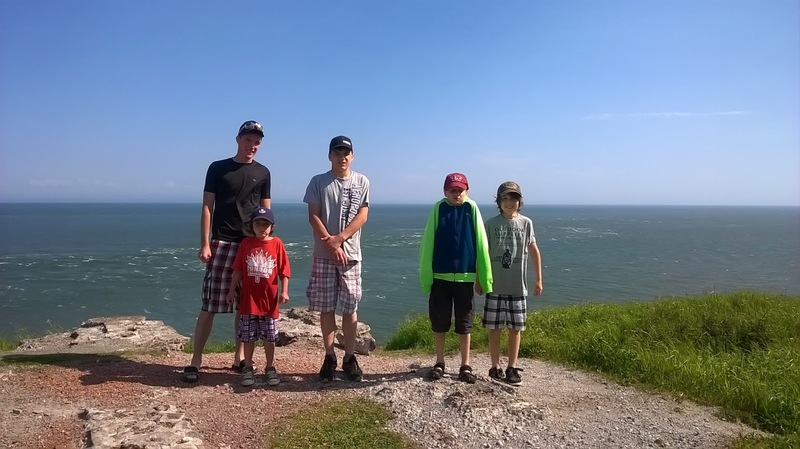 For my family we like to go into St. Martin's, NB. The quaint Village is becoming known as the jump off point for the Fundy Trail Parkway, but for me, it is more than that. I have been enjoying the Village since well before the FTP was developed. With small local shops, artisan galleries, fishing boats, and covered bridges, you can't beat it for appeal. This entry, published in a recent Kings County Record, reveals how we recently spent a day there. It is mid July and the mercury has finally pushed over 25°C. You sweat by simply stepping out on your back deck so there is only one thing you can do. You head to the beach. Luckily in NB we are fortunate enough to have lots of beaches to enjoy. 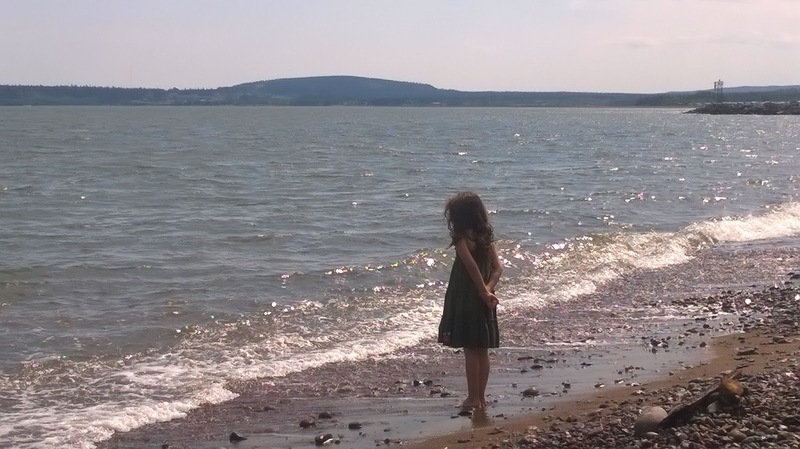 We have water on three sides, the Bay of Fundy to the south, the Northumberland Strait to the east, and the Chaleur Bay to the north, , not to mention the Saint John River runs along a good portion of our western boundary and it also has many beaches. 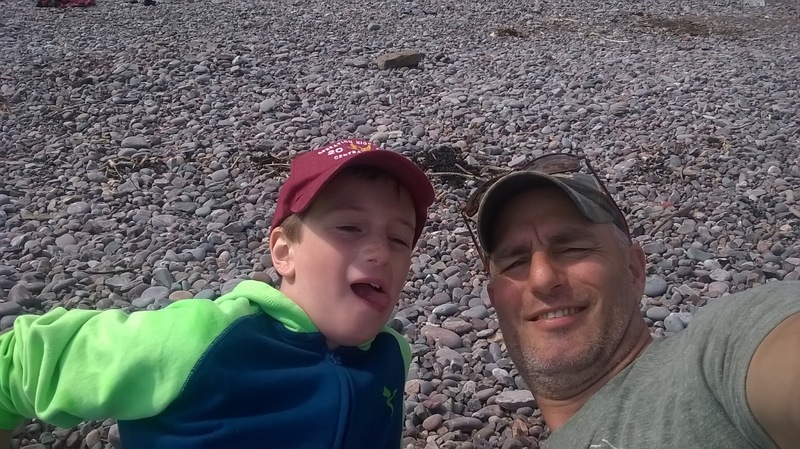 From Sussex Corner, I recently drove the scenic Route 111 into St. Martins where my family and I spent the better part of a day simply lazing around on the long cobble beach near the caves. It was amazing how well the whole day went. It was high tide so we couldn't explore the caves so we had misplaced concerns about whether the kids would enjoy the day. We had no need to worry as they easily entertained themselves with rocks, driftwood, and one another. We lathered sun screen on the kids and set them free. Instantly their imaginations took off and they were playing games in the waves and throwing stones at various targets. It was inspiring to see the way they readily developed different little games. It was like the sea breeze instantly prompted their previously dormant imaginations and sent them into overdrive. We set up a picnic area complete with coolers, Coleman stove, and camping cutlery. When I stood back and looked at the scene, I felt like I was looking at a picture out of the 1960s. 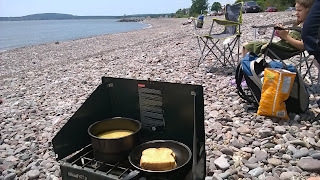 I think the Coleman stove made the scene, along with the tin plates and cups painted red with white flecks. St.Martins definitely added to the old time feel with its older homes and covered bridges. After some great grilled cheese sandwiches and soup, the kids were re-energized and went to work building their version of seawalls. Their imaginations moving towards more industrious ventures as the tide shifted and started moving back out. Their enthusiasm started to noticeably waver and the kids started drifting apart as they got tired. I watched as each of my kids wandered away from the group a bit and each became reflective and I noticed a maturity in them that I hadn't noticed before. I was oddly proud in the moment and committed each of them to memory. Okay so I took a digital photo so I'd remember it later. We decided that we should leave our mini-paradise on the beach and check out the Quaco Head Lighthouse. The short drive makes the lighthouse a great change of scenery when in St. Martins and it too is a mini paradise. The high rugged cliffs and rocky island outcrop just off shore leave no doubt of the need for the majestic lighthouse. The old foundations and remnants of old fields hint at the location's history. It would have been a great site to see when it was in its prime, but even now it is a scene that has that special feeling, a spiritual aura. It was a windy afternoon at the lighthouse so we didn't stay long but the whole day will long stay in our memories. If you get a chance you should take the trip to St. Martins and make some memories of your own.